Have a great holiday everyone. 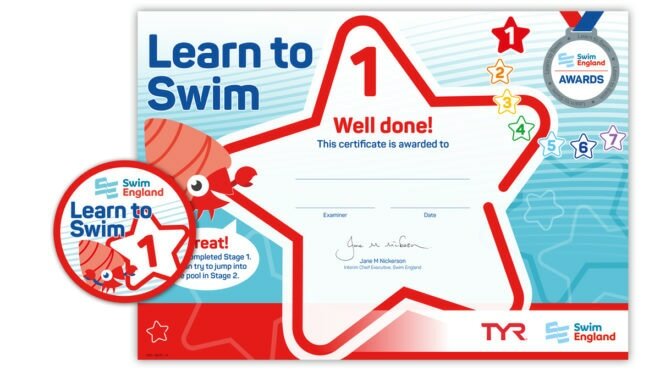 We are pleased to announce that when we return to teaching after Easter Swim Certificates and Badges will be available to purchase after each assessment. The Learn to Swim Awards 1-7 are divided into progressive stages. They make up the core, national syllabus of learning to swim for primary school aged children. They are designed to reward your child for their development of the essential aquatic skills they need to be confident, competent and safe in the water. Each of the Learn to Swim Awards 1-7 stages has a list of clear outcomes that need to be completed in order to gain each award. Speak to your teacher for more information..
We have been able to obtain more training time in a 25m pool at Whittlesey to enhance your training structure at Kingfishers. This is a fantastic opportunity for us and I am sure that it will lead to even more Regional times next year as we grow in strength and train hard during 2017/2018. On a Tuesday, the Regional Squad will now train over at Whittlesey Manor and the County and Development squad will train at Chatteris. During the year we will swap a few sessions to furt...her enhance the county squads training too. I will update further on the landtraining this week. Please can you ensure that you are on time to training and bring full kit plus drinks. A full weekend saw 15 swimmers of the Chatteris squad head for Cambridge Parkside Pools for the Cambridge Spring Open Meet. Star swimmers were Megan Donovan, Reece Rimpson, Tom Hanley, Jake Hoy and Harry Rayner. Coach Sadie Richardson was very pleased with all her charges, as all swam at least one personal best time. Hanley (13) achieved regional times for his 50m front crawl, bronze medal too, and 100m breaststroke (both PB), as well as swimming PB’s for his 100m butterfly and 200m f/c, whilst Rimpson once again swam all his races in PB times, with silver for 50m breaststroke, bronze for 100m f/c, 50m butterfly and 100m breaststroke and fourth place for 50m backstroke. Hoy got bronze medals for 100m back and 200m breaststroke and silver for 50m breaststroke, but no PB’s this time. Rayner swam seven races with PB’s in all but one and a best position of seventh in 50m butterfly, whilst Donovan (10) swam eight, from 50m back to 200m I.M., and got PB’s in all but one, with a highest position of fourth in her 50m butterfly. Mia Tandon was pleased with her PB bronze in 200m f/c whilst regaining her club record. Further swimmers with PB times were: Megan and Connie Denman, Riley Astley, Megan Dawson, Melissa Ablett, Kiera Simpson, Thea Hanley, Olivia Clark and Chloe Cook. Please download the information pack below for the warmup times for this open meet. I do have one ticket per family ticket for you on the day. Cops Mini Meet Programme for Sat 18 March - Registration closes at 5.30pm, late entries will not be accepted. Warm up commences at 5.30pm. •Please arrive at least 10 minutes before the warm up. The start time is 6.00pm. 200 IM (10-12yrs) (Ev7) 200IM (10-12yrs) (Ev2a) to edit. Chatteris Kingfishers Swimming Lessons are an ASA award scheme, designed to teach and develop a lifeskill. We are now recruiting for a fully qualified swimming teacher to assist in the delivery of our “Learn to Swim Programme” teaching children of all ages in our Swim School. •Can Deliver high standards of swimming teaching and are self motivated. Contact us by phone on 07939588767 or message us for further details or to just have a chat about the opportunity of developing your own teaching skills with us. This is a licensed Level 3 meet. This weekend saw 15 of the fastest Chatteris Kingfishers swimmers compete in the first part of the County A championships taking place in Cambridge. They faced tough competition from Peterborough and Cambridge especially. Hallie White (13) and Thomas Hanley (13) qualified for five events each and both swam well. Hallie won the 50m butterfly and got to the finals of the 50m front crawl, ending up with a bronze medal in a time of 29.77. She finished 6th in 100m I.M., 8th in 200m I.M. and 19th in 100m breaststroke. Thomas got in the final of the 50m front crawl as well, finishing in 6th in 30.36, and competed in the 100m I.M. (7th), 200m I.M. (8th), 200m back (9th) and 100m front crawl (16th) as well. Young Reece Rimpson (11) bagged bronze from the finals of the 50m front crawl, a 4th place in 100m I.M. and 7th in 200m I.M. Freddie Allen had to swim in the 12 year age group, despite only being 11, so did very well to get into the finals of the 50m and 100m front crawl and finish in 5th place and gaining 6th spot in 200m backstroke. Mia Tandon (10), Thea Hanley (10), Molly Noble (12) all qualified for the 50m front crawl, with Molly also competing in 100m I.M. Megan Donovan (10) had qualified for that, as well as for 50m backstroke and 50m butterfly. Megan Denman (12) got in the final of the 50m front crawl, finishing in 6th, as well as competing in the 50m backstroke, 100m I.M. and 100m breaststroke (15th, 19th and 14th). Kiera Simpson (13) qualified for 100 and 200 I.M., 100m breaststroke, 50m front crawl and 50m butterfly. Jake Hoy (15) competed in the 16/over group, but managed to qualify for the 50 and 100m f/c and 200m I.M. whilst Riley Astley (13) swam in the 200m backstroke and 50m f/c and Ben Noble (10) reached the 50m f/c and 100m I.M.. The last two to qualify were Connie Denman for 50m front crawl and 200m breaststroke (9th) and Megan Dawson for 50m front crawl (9th) and 100m breaststroke (8th).The club swam in 13 of the relays, but struggled against the big clubs. The best positions came from the 13/U girls in 200m freestyle and medley, both in 6th position and the 15/U girls freestyle and medley relay (7th and 9th). Many managed personal best times. The next round takes place at the end of February. Keep up to date with current Kingfisher news here.